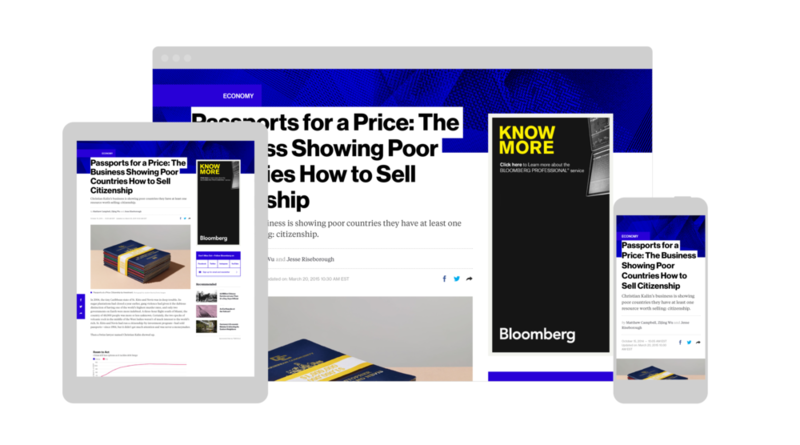 The destination for everything within the Bloomberg media universe — Bloomberg News, Bloomberg Businessweek, Bloomberg TV & content from entirely new digital verticals like Bloomberg Politics, Bloomberg Technology & Bloomberg Pursuits. Worked extremely close and collaboratively with Bloomberg developers to ensure quality of the final build. A responsive solution designed at four breakpoints to capture all device sizes. A top of page degradation system allows editors flexibility in story-telling & day parting strategies. Landing pages utilize a mix of dynamic trending & firehose vertical content modules with editorially curated packages. Evolution of the homepage from traditional to psychedelic to somewhere in between. Each Bloomberg vertical is branded with distinct colors & modules to cater to content & consumption type. Modular shoulder templates allow for user pathing to anything from single detail pages to packaged story arcs. As an alternative, these shoulders also provide a space for sponsorship opportunities. When it comes to digital publishing, article is king. The design system uses multiple templates to give the editors the appropriate tools for varying content types.